Asura: The City of Madness, directed by Sung-su Kim, follows a corrupt cop down a bloody path of corruption and politics as he plays both sides of an investigation between prosecutors and the city's mayor. The film features acting performances from Woo-sung Jung, Jung-min Hwang, Ji-hun Ju, Do Wan Kwak, and Man-sik Jeong. Reservoir Dogs. Heat. The Departed. Oldboy. Drug War. This movie reminded me, in one way or another, of each of those films. Sung-su Kim has put together a very dark, bloody, chaotic story that whether you like it or not, will hold your attention from beginning to end. It is a brutally violent film that pulls no punches when it comes to fight scenes that are as bloody as they are intense. The story itself doesn't really cover any new ground although it does lay the groundwork for some inspired acting performances. 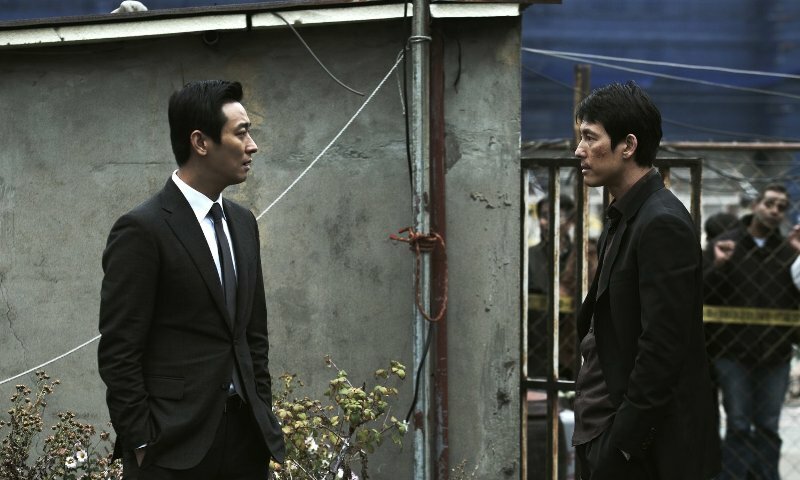 Woo-sung Jung, in his fourth collaboration with Sung-su Kim, is very impressive in the lead role as a police officer who is secretly working behind the scenes for the corrupt mayor, played enthusiastically by Jung-min Hwang. The duo work really well together as opposing forces who maintain a tenuous relationship built off of necessity and a family connection. The rest of the cast is pretty solid with a standard mix of characters on each side of the law. 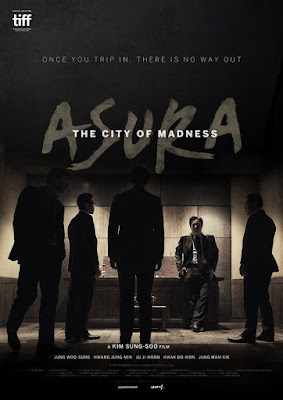 Asura: The City of Madness is a strong effort from a very talented director although I have to say, it's definitely not for everyone. If you can handle a film filled with dark, intense, and bloody action then you'll most likely enjoy this film. At two hours and 16 minutes, it's a slow burn that takes its time building to an all out, blood soaked climax filled with violence and betrayal around every corner.